The Intel SSD 600p is a genuinely affordable half-terabyte drive that’s built using the twin performance pillars of the PCIe interface and the NVMe protocol. It’s Intel at their smartest, swallowing their technological pride and taking aim at the mainstream SSD market. Want to know what the very best SSD is right now? Check out our guide to the best SSD for gaming. It is though a bit of an anomalous SSD, ploughing a very different furrow toSamsung’s excellent 960 EVOor even Intel’s own SSD 750 drives, but that’s all to its credit. It also represents the first time Intel have used their own 3D NAND memory inside an SSD, which is interesting considering that they’re doing so with such an impressively affordable drive. What Intel’s SSD 600p is trying to do is push past the performance limits of the SATA interface while undecutting the high prices of pretty much all other PCIe-based SSDs. At just$180(£156) it’s almost the same price as Samsung’s aging 500GB 850 EVO. Intel have been very aggressive, and very un-Intel, about the way they’ve approached this latest drive. Where the Intel SSD 750 is all high-price and own-brand components, matching Samsung’s keeping-it-in-the-family ethos, the SSD 600p is all about sacrificing peak PCIe performance to ensure they don’t max out the cost. And that’s not as bad as it might sound. Click on the quick links to jump to your favourite section. I particularly like the verdict, cos I’m judgemental like that. There are two firsts inside the 600p, namely the 3D Intel TLC NAND and the Silicon Motion SM 2280 memory controller attached to it. Triple-level cell NAND (also known as 3-bit MLC if you’re Samsung) is the cheaper alternative to multi-level cell (MLC) or single-level cell (SLC) memory as it is able to store three bits of data per cell as opposed to two or one bit. That means you either get greater capacity or the same space but in a much smaller area and hence much cheaper storage. The downside for TLC NAND though is that it’s slower than either of its SLC or MLC brethren and has lower endurance and reliability ratings too. Those modest restrictions aside, it still makes TLC the current NAND design of choice for pretty much all mainstream SSDs. This may be the first time Intel’s 3D NAND has appeared on a PCIe SSD, but it’s not the first time it’s appeared on any drive. It was co-developed with Micron and we’ve already seen the stacked memory being used in the Crucial MX300 750GB SSD. The 3D part was introduced because of the need for greater capacities in ever smaller package sizes. Shrinking down the scale of a NAND chip though leads to similar interference issues that manufacturers have found creating smaller CPUs. Stacking the memory vertically means greater density without having to create ever smaller chips. The issue is that it has been expensive to produce, though that is evidently changing. The other side of the Intel 600p equation is the fact Intel aren’t using their own-brand NVMe memory controller they introduced with their SSD 750. 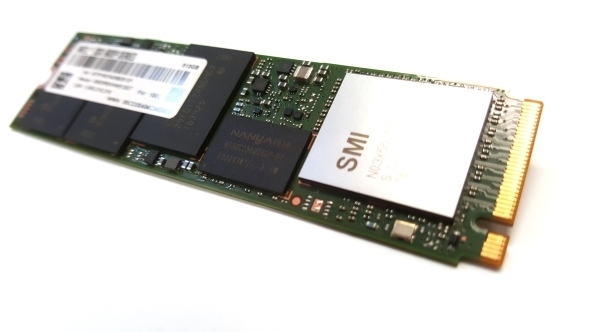 Instead they’ve opted to bring in a customised version of Silicon Motion’s first NVMe controller, the SM2260. Silicon Motion’s controllers are often brought to bear on mainstream offerings thanks to it being both cheap to license and very low powered. As you can see there are none of the extreme heatsinks which covered the SSD 750 and its Intel-made controller. We’ve deliberately stacked the benchmarks in this order to show how the latest Intel drive performs up against similarly-priced SATA drives rather than just against much higher priced PCIe-based SSDs. In those terms it’s clear just how well positioned Intel have made their SSD 600p. The SSD 600p isn’t orders of magnitude quicker than either the Crucial or Samsung SATA drives, there’s certainly not the performance delta you get when you put them up against any of the NVMe drives from Samsung. But it does offer performance beyond what the SATA interface can deliver and in the case of the read performance by around double. 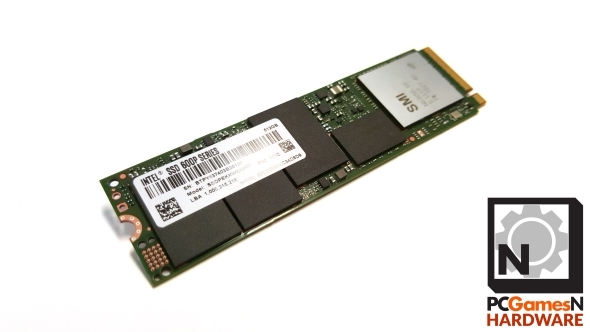 The write speed of the SSD 600p is what would let it down as a luxury NVMe SSD. It’s that which hobbles the drive’s overall performance and means it’s not an absolute no-brainer in terms of being the ultimate budget SSD. You can see the the performance disparity in the real world performance tests where the compression speed is almost up there with the quickest PCIe drives, while the actual mixed media folder transfer takes twice as long as with the SSD 750. It looks like an issue with the slower 3D TLC NAND as much as the interface – the Crucial MX300 is even weaker in this test, taking another 51 seconds to transfer the 30GB folder. The random read performance of the SSD 600p is also rather middling, as poor as most low-end SSDs running on a SATA connection. The random 4k file tests are a good indicator of how zippy a drive will feel in general usage, where the OS is constantly shunting tiny files about while your PC is awake. To be fair the 4k read performance is pretty low across the board, especially in comparison with the 4k write speeds, but the SSD 600p is still bottom of that list. If you can’t see the price widget it might be because your browser is running ad-blocking software. If you pause it you can check out the latest deals. The SSD 600p isn’t the fastest PCIe drive you’ll find, but it is looking like absolutely the best value. The makeup of this SSD shows a very canny Intel targeting an under-served section of the storage market without being restricted by a false pride in their own technology. 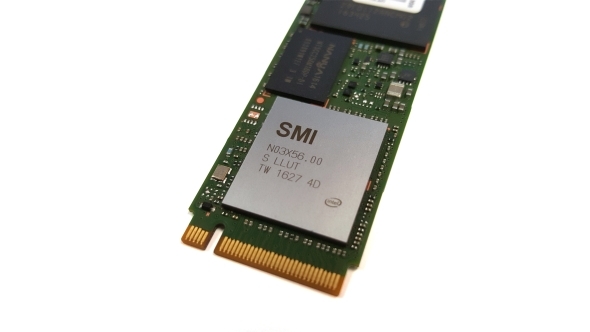 They weren’t too proud to drop in the cheaper Silicon Motion controller instead of their own expensive NVMe silicon and they’ve picked the cost-effective 3D TLC NAND to form the data storage parts of the drive. That means the Intel SSD 600p is a great price for a 512GB SSD and not just a great price for a half-terabyte PCIe-based drive. It costs almost exactly the same as the aging Samsung 850 EVO and yet has it beat almost across the board in terms of overall performance and, almost more importantly, in terms of endurance too. They’ve both got a five year warranty as standard, but the SSD 600p is rated at 288 total bytes written (TBW) while the 850 EVO is just 150TBW – that’s almost half. The SSD 600p has certainly got it pegged in terms of form factor too. 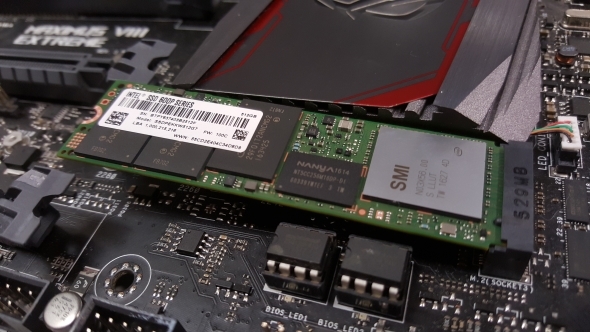 If you’ve got an empty M.2 slot on your motherboard or in your laptop, and have been longing to find a way to fill it, then the SSD 600p is the perfect entry point right now. The next step up is the more expensive 500GB Samsung 960 EVO, which is around $70 (£100) more at the checkout, though is considerably quicker. Still, right now the SSD 600p is the perfect bridge SSD between the SATA past and the PCIe future of solid state storage.